Was he a member of the elks or did they present him with it as a gift? Look at the picture to the left I don't think it looks like him the nose is to big he had a small nose. Houdini was an Elk. He became one in 1912. The pic on left...yeah, big nose. But I'm not sure we can really judge features on that photo. Photos play tricks. What I find strange about that photo is it says it's at the West End Funeral Chapel. Is there any other record of HH lying in state before the Elks Lodge on Nov 4? John he was initiated for sure. You don't get to walk into being a member in the Elks or given a membership. You have to be initiated. That's why he like the lodge room at 43rd street location so much that's why he wrote a letter and put it in the NY Elks #1 safe. Only to be opened if he died. That's what I have been told. He took that letter to the lodge secretary personally with Bess and his co-worker that helped him. Letter said when he died, he wanted his funeral inside the big lodge room inside the Elks Lodge. They didn't put that in the History Channel 2 night show. Just as well I hope you know he was a NY Mason in St. Cecilia's Masonic Lodge #1. Don't believe call the Masonic Grand Lodge of New York. They will tell you the same thing. His picture hangs out side the lodge he belong to in the Masons. So Houdini was a real mason and a Elk as well. When his funeral happened the Elks & Masons all gathered at his funeral inside New York Elks Lodge #1. The Elks lodge on 43rd was torn down wrongfully. But, the Masons club house still stands today. Hope that answers your question on Houdini's membership. Now, my question why wasnt the TV cameras allowed to go into the lodge room on the top floor balcony and shoot Houdini's funeral? Instead of making them wait outside to shoot his coffin coming out of the New York Elks Lodge #1! Or does the family estate have more pictures or film that was shot inside... What's up with that??? These were film cameras that needed a lot of light and shooting inside would have required beaming bright lights onto the casket and mourners. I don't think anyone would want that. It also it could be the Masons didn't alow news cameras inside the lodge. Well the Elks Lodge Room was heavily fortified with huge amount of lighting in the lodge room. This wouldn't of been a problem. Don't forget this is not a Masonic Home! This was the Elks invited the St. Cecilia's Masonic Lodge #1 to do a Masonic rest along side the Elks rest and Jewish interment. Don't forget these rest burial ceremonies are meant for the public. They are not private ritualized floor work by the Elks or Masons. Which the 2 org's. are very similar in nature in more ways then one! Not sure which photo to the left you mean that does not look like him?? Amazing stuff, which deserves a lot more research. Thanks for this as always. It is amazing how much stuff about Houdini is surfacing so many years after his death. People in those days did not dig so deep and accepted many things as fact, that we now have questions about. Superb! Once again, you've outdone yourself John! Some things dont make sense. When you see the pallvearers carring the coffin with all the flowers on top if you look at its sides it appears to be a ....coffin...NOT the glass covered box you see him laying in (dead or alive) in the other photo. The box with the glass lid looks like a bix with a glass lid NOT acoffin. I agree with John that the other know photo of Houdini laying in state is not him....the coffin that pr rson is in does not have a glass lid. Perry. Agree. Some of these things seem to contradict each other. It's a puzzle with some possible false pieces. I think we have established that in the photo from Jon Oliver, Houdini is NOT DEAD. He is just in Worcester. All the records of the construction of Houdini's coffins still exist and they make it clear that the coffin he is in in the Worcester outdoor stunt -- which my grandfather witnessed -- is a COFFIN LINER with a GLASS TOP. John published quite a lot about this coffin not being completed in time for the test in the Worcester YMCA pool. This coffin had it's own packing case and there are photos of the case carrying the body home. Now, the question is -- and maybe it's been answered -- is that glass topped coffin liner still inside the casket? And has Houdini escaped from it? (as he did when it was buried under sand in a large glass box onstage in Worcester). A lot of guys have contributed to this subject, thanks to Mark Russell and the rest. I've got a good chapter on the whole subject of Houdini and coffins in Houdini--the Key, and I think it opened some of the doors that have produced this new material. The coffin liner that Houdini may still be in has a flat top. Funeral homes have a kind of rounded dome that fits on an open casket. Was the coffin that arrived too late for the YMCA test the coffin in the onstage escape? Was it the coffin in the outdoor stunt? Is that coffin liner inside the casket that is buried in Macpelah Cemetery? I have spent my whole life thinking that my grandfather saw Houdini do an outdoor straight jacket, and, thanks to this blog, I know now that he saw Houdini in a coffin liner with a glass top outside a furniture store. Thanks Patrick. Great info. Your grandfather saw Houdini? How did I not know this? Cool! Not sure we ever fully determined that the glass top coffin pic was of a live Houdini at the department store test. It's a good theory. But the possibility that it's the dead Houdini haunts me, especially because of what Bessie wrote on the photo. The thing that throws me about that pic is what appears to be thick dark hair on the arms up to the wrists. Houdini didn't have hairy arms like that. But, again, could be a trick of the photo. But if Houdini is being carried from the elks lodge inside of an actual coffin there would have been no need to cover it's top with flowers to prevent Houdinis body from being seen as this story suggests. I would think there would have been no need to remove Houdinis body from the liner so my assumption would be he Is still encased within the liner inside of the coffin. Not to be morbid but.......Houdini was buried with a packet of letters from his mother as a pillow. Would it not be a huge historical event if these letters could be obtained and photocopied? I would think so much could be learned. There was a fake attempt to dig up Houdini 4-5 years ago but what would it take to make this really happen with the sole purpose of Gaining access to those letters? As for the flowers on the casket, that was in vogue back then. Take a look at Valentino's send off a year earlier. In some ways, Valentino and Houdini were very similar at the end of their lives. Good points, Kevin. Especially about Valentino's funeral. Several similarities between these two famous funerals which happened only a few months apart. No riots for Houdini thought. One thing this photo has going for it is it's definitely the inside of New York Lodge #1 and it's definitely a funeral. If we knew how many funerals were held there, that would give us our odds on this being Houdini. As far as caskets not matching…well, the story from our source is the casket used that day was one the Elks bought themselves and it never left the building. But that's also a convenient explanation of why it doesn't match. Yep, all this has crossed my mind. Let's look at that Elk's photo and the pallbearer's shot for any clues that could help us. Some of the people waiting in line at the Elk's Club are wearing winter overcoats. This day is supposed to be November the 4th. That would have been a cold day in N.Y.C. In the next photo of the coffin leaving the Elks Club, I see four cops around on the street outside. A cop at the viewing inside the building, four cops outside the Elks Club. Whoever is inside that coffin in the Elks building, he or she must have been somebody important. I'm also trying to see if the flowers at the viewing match those on top of the coffin in the next photo. Hard to tell. There might be a long ribbon on the coffin that could match the one near the coffin inside the Elks. I'm also trying to match anyone in that line to anybody in the crowd in the next photo. Admittedly, this is close to impossible, but worth a try. I also see a police officer standing close to the line. Woops, the last sentence slipped past me. That police officer in line was the one already mentioned. Why is there a cop at the viewing? Good detective work. There certainly is a police offer there (I didn't see him before) and his uniform matches the ones we see outside. The presence of a police officer suggests that this is a public figure. With the ruckus at Valentino's funeral only a few months before, maybe that's why we see a police presence here. The NYPD was there for crowd control and some cops were members of the New York Elks Lodge #1 & or the NY Masons! It couldn't hurt to have law enforcement around just in case something happened not planned!!! Would Bess and Harden would be buy the casket? Doubtful. This was a public viewing with thousands of people passing through. Could have taken hours. Certainly Bess wouldn't have been able to handle it. She was a wreck. We see her collapse in the funeral footage. BTW, I believe Marie Blood rode in the limo with Bess. I seem to recall her talking about that. On page 248 of Milbourne Christopher's Houdini: The Untold Story it reads: " Someone at the Elks Club remembered that Houdini had left a sealed envelope, to be opened only after his death, in their safe ten years before. It was opened. The master showman was still in charge. The letter gave specific instructions for his funeral. The services were to be conducted in the vast Elks Lodge ballroom on West 43rd Street, just off Broadway. Two thousand people jammed into the Elks for the two-hour ritual. Even at the end Houdini drew a standing-room only audience." 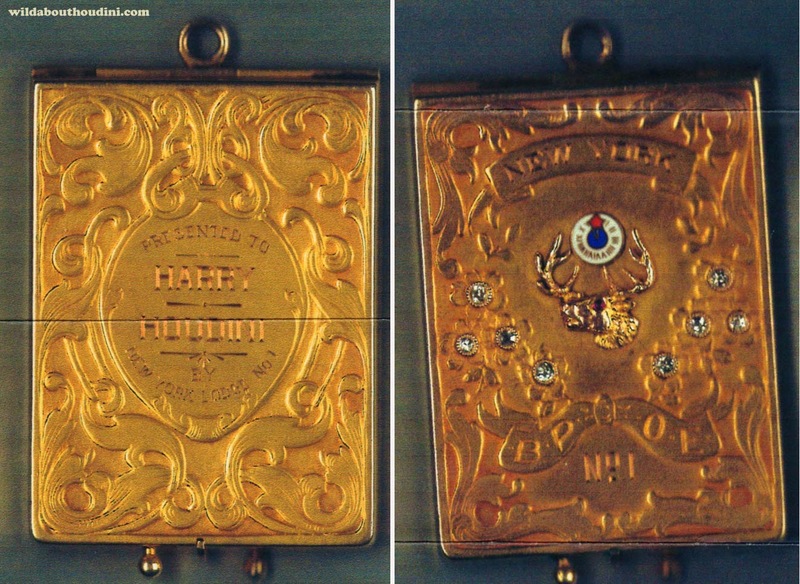 You know, there's a reference in either Kalush or Silverman to the braze casket lid being "screwed on" at the cemetery. What is that about exactly? I know the motives were dubious, but I'm kinda sorry the exhumation didn't happen back in 2007, if for no other reason that it would have answered all these questions about exactly what he was buried in. Regular coffin? Trick coffin in regular coffin? Glass top? Would have been fascinating. Can you imagine a DNA sample? Could put to rest the Gilmore rumor of Houdini having a child. And at least one more I can think of. Although it might be possible to use DNA from other descendants of the Weiss family. There really is no evidence that Houdini was buried in his coffin liner....is there? We know his body was shipped back to NY in it but there is no clear info that his body was within that liner afterward. You would think the funeral home would just use a normal casket unless the family wanted something else. His body was taken to the W. R. Hamilton and Company Funeral Home at 3975 Cass. There was no public viewing of his body. Just a couple of weeks earlier, Weiss had order a massive new coffin for use on the stage. He expressed a desire to be buried in this prop. The lining for the coffin was sewed in Detroit the day of his final performance. Apparently, the Hamilton Funeral Home placed his body in the coffin, but then later removed it. There was no public viewing of his corpse and the coffin remained in Detroit. On Monday evening November 1, 1926, the New York Central Railroad added a special car to their Detroiter train to carry Houdini's remains back to his home town. Only his wife and his brothers accompanied his bier. If the above is true, big question mark, then does that imply that the coffin (i.e., magic prop or casket liner) remained in Detroit and that a brier (a movable frame) was used to transfer Houdini’s corpse? We do have a photo of Houdini's casket being unladed at the train station. The container doesn't seem to match anything we see here. It may just be some kind of railroad shipping container? It's certainly not a coffin. Coffin liners were intended to protect the body even as the coffin developed leaks. It would go inside the casket. Look at the photo of it and the coffin being borne by the assistants. It's not a Gozinta Box. It looks like a fit. I would swear I read somewhere he was still in that liner. Melville Cane wrote in his poem "Houdini" wrote:"The hearse was framed in glass, Was screwed with screws of brass, And only light could pass." I don't remember reading about screws in the coffin, but, wasn't the lid of the glass topped coffin liner fastened down with screws or bolts? I was doing a little reading up on glass caskets, etc., and in some cases bodies were sealed in glass containers within caskets when it was an open casket funeral. This is because embalming wasn't quite what it is today and these bodies could be pretty ripe. The lid of the liner screwed shut. I think its common language to say that a coffin lid was screwed shut even if its not. Generally there is a lever locking mechanism on a coffin lid. I say lets get an ok from Hardeens great grandson and exhume Houdini to answer all of these questions. Perry. I'm all for it! But unlike last time, let's be honest about the reason: We're ghouls! At the unveiling of the monument at Machpelah Cemetery in 1927, one of the speakers was William T. Phillips of Elks Lodge No. 1. Yes, Willam T. Phillips was the secretary of the NY Elks lodge #1. I have their circulars book that was 1934-35 James Garret Wallace PER's book of circular notes. The year they lost their grand old building on 108 west 43rd street. Email some time I have a good bit of their history to share with you my brother Elk! In the letter written by Houdini to magician James S. Harto during the week of Sept 27 when he was performing in Worchester, it mentions “a coffin with a glass front” lowered into a vault which has a glass, so he can be seen all of the time until the sand completely covers everything. This may have been the casket that arrived at noon on Sept 28th, two hours after the YMCA test. I believe the YMCA test was a coffin with “a glass top”. So we have a coffin with a glass top (YMCA test) and one with a glass front (Buried Alive Stage Prop). I believe he used his new glass top casket first for the Summerfield department store test, and said then it was the casket he'd be buried in. Remember THIS POST. Correction: The YMCA test was not a coffin with a glass top. The one with the glass top arrived two hours late, which still seems to be different than the coffin with a glass front used for the Buried Alive Stage. Why are their not more photos of the actual Houdini funeral when it was going on. Why bring up NYPD at the New York Elks Lodge during the funeral. Large groups of people could always use a couple of good cops to keep it all calm! Their tops and which one he was in? Look Houdini was a Elk & a Mason. He was initiated at the 43rd street NYC Elks Lodge#1 where he also had his funeral in the same Elks Lodge Room. Not the so called ballroom. The Lodge room in NY#1 was renamed when the Diplomat Hotel group took over operating the building. The Diplomat called the huge purposely built Elks Lodge room it's "Crystal Ballroom'. To heck with crying about his death or his coffin he was buried in. I ask what was it like to initiate Houdini? What was it like to see him go through the initiation? Ah, as well what was it like to have a drink with Houdini in the Elks Lodge billiard of NY#1? These are the questions you guys should be asking about instead of coffins and coffin use, really??? I also speculate on Houdini if he like being initiated into the NYC Lodge of Elks! Did he like the Elks initiation better or being initiated into the 1st degree of Freemasonry? Which one he liked better? All great questions, Jason. Wish we had the answers. There have been tons of important movers & shakers in the NY Elks Lodge as members or addressed the big NYC Elks Lodge. Names like Gen. Pershing addressing the NY Elks Lodge or past New York Goverment officials you name it! In all I wish I had a time travel machine. I would love to go back and see Houdini's funeral or even better his Elks initiation. That had to be a packed lodge room and very intense. I did a bit of research. If indeed Houdini was buried within a air tight coffin the whole idea of an exhumation is a very bad idea. Nothing can evaporate so what one will find is mainly a slushy mess. In the 1960’s, I had to pleasure of meeting Arthur B. Rothschild, the son of the founder of the West End Funeral Chapel. I knew Arthur and worked with him and the last time I saw him was around November of 1978. 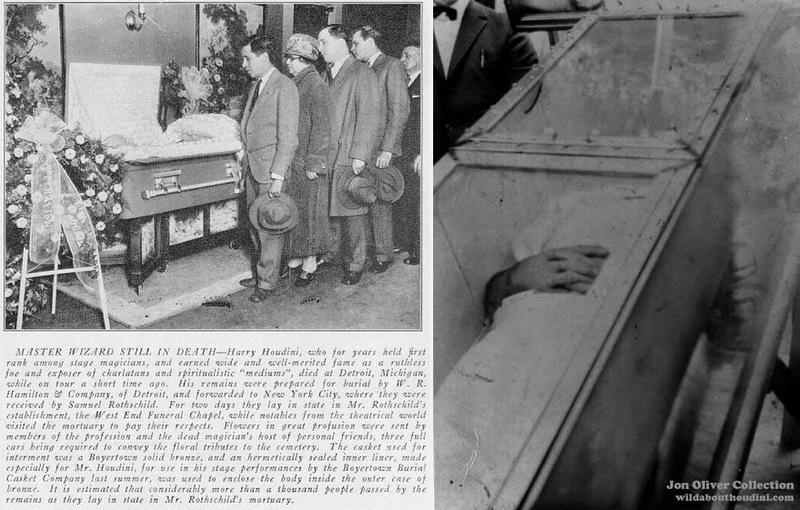 The “casket” in which Houdini was transported in to New York City, was actually a copper or bronze liner. This is something that could be placed inside a regular casket, then sealed to offer additional protection to a body. Houdini used this for some of his under water stunts. The actual casket that Houdini was buried in was a cast bronze casket manufactured by the Boyertown Casket Company. 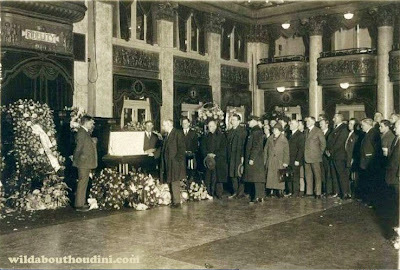 However, the Elks Club, where Houdini’s funeral service took place, preferred that a wooden casket be displayed (possibly because some of the members were Jewish and felt a metal casket, especially a cast bronze, was not in keeping with Jewish tradition.) After the funeral service, the cast bronze casket was taken out of the wooden “outer” casket, carried to the hearse and then transported to Machpelah cemetery. This is the way Arthur B. Rothschild told it to me.